Matthew is one of only a handful of Veterinary Dentists in the UK and established the New Forest Veterinary Dental Service in 2011, to provide a service for referral veterinary dental and oral surgery procedures for other veterinary practices. He sees around 1000 cases a year, ranging from routine work to complex dental and oral surgery cases including extensive maxillofacial reconstructions following trauma and oral cancer surgery. He has carried out ground breaking jaw removal surgery (mandibulectomy) in Pygmy Slow Loris, which weigh as little at 350g! His main interest is in endodontic (root canal) treatment of teeth, and has carried out over 3000 root canal procedures in dogs and cats. 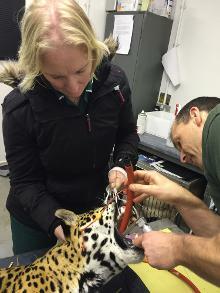 He has even carried out root canal treatment in Tigers, Lions, Leopards, Otters, Wolves and several primate species, which really pushes these techniques to their limits! Matthew publishes regularly in the veterinary literature and is a reviewer for a number of publications. 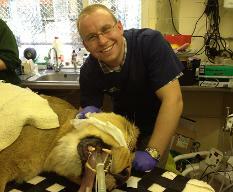 He lectures on Veterinary Dentistry at the University of Surrey. He is the course organiser for the British Veterinary Dental Association, a role which involves providing and co-ordinating undergraduate teaching at Bristol and Cambridge Universities, as well as the association's numerous postgraduate courses for vets, both in the UK and in Europe. In addition he has previously lectured and tutored at the Universities of Liverpool and Nottingham. He holds the European Certificate in Small Animal Surgery. Matthew has lectured at all of the veterinary conferences such as BSAVA Congress, The London Vet Show, VetsSouth, VetsNorth, the BVDA Annual Scientific Meeting as well as at meetings and conferences outside of the UK. He also provides an in house CPD service for practices we are keen to learn more in their own environment. He has contributed to the on line resources at the Boehringer Academy and Vetstream. 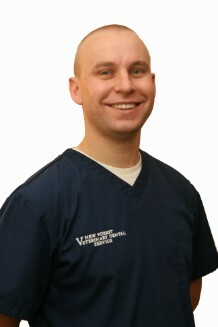 Matthew provides referral veterinary dentistry and oral surgery at Priory Veterinary Hospital (Christchurch), at South Devon Referrals (nr Exeter), at Lumbry Park Veterinary Specialists in Hampshire and in West London at Runnymede Hill Veterinary Hospital and Stone Lion Veterinary Hospital in Wimbledon, London. Referral appointments can be booked through Sue Vranch. Sue has worked with Dr Cecilia Gorrel for many years and is known to many of the vets in the south through the advice she has provided to them in this time. Sue has co-authored the dentistry chapter in the BSAVA Nursing Manual and co-authored "Veterinary Dentistry for the Nurse and Technician" with Dr Gorrel. She has an unparalleled 20 years of experience in veterinary dental nursing.